Black Friday 2008 - Different From Prior Years? Thanksgiving is upon us and while many people are winding down and relaxing after dinner with the family, others will be gearing up for one of the busiest days shopping days of the year. This Black Friday will likely prove to be a bit different than the last several years. Although the economy is suffering, this year most people will not be foregoing gift giving altogether, so you can expect fierce competition as you venture out to find the best deal of the season. Here are a few tips to ensure a successful mission this year. Be Prepared. The day after Thanksgiving is not the day of the year when you want to be strolling leisurely down the aisles browsing at items with no clear idea of what you want to purchase. Seasoned shoppers are out in droves and they are in it to win it. You will want to have a list of who you are shopping for and a general idea of what you want for them. Have the name, age, and gender of who you are shopping for listed to help keep track of who gets what to ensure an appropriate gift. Have your budget in mind. You may want to break down your total budget by how much you are willing to spend on each person and the number of gifts you want to purchase. It is far too easy to go overboard when shopping and if you overextend your budget you really aren't “saving” a thing. It is especially important to use caution and keep your budget in mind when shopping with credit. Far too many people spend more than they can really afford only to suffer in January when their statement comes around. There isn't much joy in gift giving if you are still paying for it July. Research, Research, and Research. This year especially should provide intense competition among retailers. With the dismal economy and many people cutting out frivolous spending throughout the year, many stores hope to make up for slumping sales by providing deep discounts for holiday shopping. To ensure you are getting the best deal possible, it is important to do some research in advance. Check out circular fliers from stores you intend on visiting. Another excellent tool is the Internet. Many retailers will have information available online, such as store hours, door busters, sales, discounts and other valuable information you can use to prepare and compare where you will get the most for your money. The holiday season is a time for us to gather with our loved ones and be thankful for all that we have. Our holidays have become painfully commercialized and finances might just provide you a reason to rein in your spending and rediscover the point of the holidays. Gift giving is great, giving of yourself is even better. 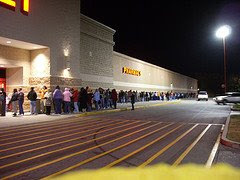 To all who are venturing out this Black Friday, Good Luck and Happy Shopping.